Why Don't More Professional Drivers Use Traffic-Enabled GPS? A couple years ago, when I first noticed the ability to overlay a traffic report on Google Maps on my iPhone, I assumed that the world of drivers — especially people who drive for a living — would take it up very quickly. In a place like New York, choosing a free-flowing route versus a congested route might save you 30 or even 60 minutes on an airport trip. But I seem to have been quite wrong. In most instances when I take a taxi or hired car to/from an airport, the driver doesn’t check any kind of device to see where traffic is heavy and where it’s light, even though smartphones with map and traffic apps have exploded in the last couple of years. Once in a while, he’ll tune in to the all-news radio station to get a spotty traffic update. Therefore, I usually now check my traffic app as soon as I get in the car to see what routes are looking good and which are looking bad, and then relay that info to the driver. Why don’t more professional drivers use traffic-enabled GPS? Taking the same old route is a habit, and habits die hard. Maybe they think the technology isn’t very good (it certainly isn’t flawless) and it’s just not worth messing with. Maybe the kind of driver who would use a traffic app is a more enterprising worker than average, and more enterprising workers don’t want to drive for a living. Maybe drivers don’t have a strong incentive to speed things up — if, for instance, they’re being paid by the hour (but often they are not). What am I missing? What do you think? Maybe drivers don't want to argue with passengers who insist the driver take a particular route. If a driver suggested a route to me that he claimed was "faster" but I knew the route to clearly be longer, I'd assume he was padding the fare. If they're getting paid by the mile, they could be accused of taking a longer detour for their own financial gain (even though they'd be savings loads of time for their customer). Who wants to fight that battle? I think this is a strong possibility. When I was on vacation recently I got directions from locals and compared that to what my phone recommended and usually the locals route was the second or third route on Google Maps recommendation. If they know without checking the traffic app which roads have a heavy traffic and which don't out of experience (not out of habit in this case), then they won't need the app. They may know which roads get heavy traffic at which hours, because they travel them frequently and for a long time. Having been a professional driver, one thing I've noticed that people don't understand is how tiring the job is, especially in a city. The constant processing of low-level information kind of cooks your brain. It's not conducive to rationality (think about road-rage), or constantly fiddling around with devices. Not the most logical behavior, but then driving around a big city all day (my experience was in London) has a way of battering our logic circuits. Or maybe they just enjoy your company. I suspect professional drivers who drive in a limited region (e.g. NYC) have much more experience than us mere humans. Making the utility of such applications limited for them. E.g. currently these applications usually have some delay in reacting to forming congestions, especially during rush hours, which anyone with experience can foresee. Maybe it's not worth the perceived risk of taking your eyes off the road in NYC traffic to plug in every destination. Also, airport trips are flat-rate, so the incentives are skewed. It would be interesting to see whether driver behavior varies from day to night, when it costs more for a driver to rent a cab because he's likely to earn more from higher demand. * No machine will be able to tell me, a person who has live din this city for X years, what the best route is, I ALREADY KNOW! This pro driver doesn't use one because I have to be concerned with bridges and trucking routes. 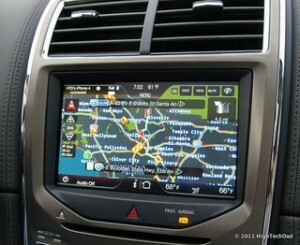 I wish my pro driver GPS had traffic information because I'd use it! In Chicago, the radio report is reliable as are the electronic billboards that post traffic times. In addition, at least with respect to getting to the airports, the really is not a viable alternative from downtown. If someone makes an explicit decision and is wrong then they have some responsibility for that decision. If no decision is made then any traffic delay was out of their control and they are at the mercy of circumstance, and have no responsibility for the outcome. I think it's probably the fundamental attribution error. When they pick a route without traffic, they reinforce their innate belief that they can pick the best routes and when they pick a high traffic route, it's the fault of other cars and beyond their control to get to the destination quickly. I'd like to design an experiment to test it though. The answer, ironically, is that they are better economists than you are. The various routes through New York traffic can be thought of as offering a "market" in travel to your destination, with the travel time being the "price" of the trip. To the extent that you have information that others do not, you may be able to exploit that to gain a price better than the average market participant. However, once the information is public, you are going to get the same price whether or not you have the information since the price will converge to the true price through the actions of the other market participants. In simpler terms, once the use of traffic-aware GPS is sufficiently widespread, drivers will converge to the less congested route until the travel time is equal to that of the more congested route (it will be less congested in exact proportion as the route is longer). So use of the smart GPS will not provide any advantage. It sounds like professional drivers have concluded that point has been reached in New York, and you are wasting your time trying to "beat the market". This is happening in some places. In particular, the GPS says "skip this, it's congested", but doesn't know that the alternate route is equally congested, because the alternate doesn't have sensors. As a pizza driver for 20 years, I can tell you quite simply. It is wrong too often. Traffic does not update nearly fast enough. Don't believe me? Drive with it on for a week. How many congestions and accidents do you not find when you drive by. Also, each software has biases in their respective programing. Things like preferring highways. Google maps suggests a "quick" 2 mile trip up the highway for me on a regular run. I choose the 4/10ths of a mile alternative at a saving to the customer of about ten minutes. GPS is not accurate enough on closed roads either. Not just a road closed due to construction, but a road gated off decades ago. Even when the gate is visible on streetview. The chargeable units in a cab include stationary time. If journeys were efficiently executed the existing cabs would not be busy all the time. A large supply of cabs would eventually drive down the price and or drive cabs out of the market. For a cabbie, it is better to earn $0.50 per 60 seconds rather than nothing while driving around the streets waiting to be hailed. They may follow a different pattern of behaviour during peak times. This argument if not as strong for flat rate fares where you would assume that the cabbie would want an efficient journey to maximise profit. Unless, normally, the cabbie would not have fare paying customers for the full duration of the journey otherwise. There is also a market for the "medallions" and the cab owners have a vested interest in keeping the cab journey market buoyant driving the price of medallions higher (they would view it as a capital investment). The price of the medallions often gets inflated and a bubble is created. In most urban areas the streets are jammed followed a specific regular pattern. Think of Rush Hour, Supplies for restaurants and retail and waste collection. And regarding this a regular driver can be as smart as a navigation system. Also a lot of traffic jams are simply the effect of traffic lights. The only chance to bypass big intersections are short cuts throug smaller streets but navigation systems seldomly find those. In DC at least, the wait rate seems to start soon enough that sitting in traffic doesn't hurt the fare too much.